Go ahead…you know it, sing it…there’s no one listening…”Is that the Chattanooga Choo Choo”? Yes in fact it was the Chattanooga Choo Choo! 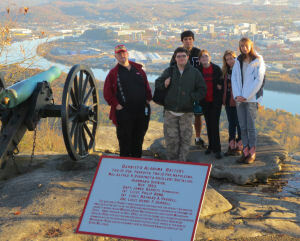 November 14 to November 18 found me and my class on our annual class trip to Chattanooga, Tennessee. In fact we did stay at the Choo Choo and I must say that it was a very interesting place with lots to do. The truth is that we spent most of our days outside doing a wide variety of things. We left school around noon on the 14th and with good highways made our way to downtown Chattanooga and the Choo Choo by 7pm. It was odd driving into the city at night because you couldn’t get a good perspective of where Lookout Mountain was, or where the riverfront area would be. Early the next morning we were up and on the CARTA buses, which was a free shuttle system that is in place in Chattanooga and made our moving around so much easier; we grabbed the bus and made our way to the Tennessee Aquarium by 10am. I wasn’t sure what to expect- but for sure this is the best aquarium I have ever been to. It was composed of two very large buildings; one housed the saltwater fish and the other the freshwater species. The kids were able to touch stingrays and one small shark as the aquarium was very hands on and interactive. I had allowed 2 hours for us to visit the aquarium and scheduled us to see the IMAX Shark movie in 3d at noon… we had to leave early and then return later to finish our tour of the freshwater half. If you are ever in the area or simply passing through, please take the time to visit this one of a kind facility-you won’t regret it. On Saturday the weather continued to be a factor as we had a cold, foggy drizzle sort of melting down upon us. We were once again up early and on our way to Chickamauga, Georgia to visit the civil war battlefield and museum. If you don’t know…Chickamauga was one of the last real victories for the south, although you might be hard pressed to call it much of a victory as the three day battle had about 34,000 casualties, second only to Gettysburg. 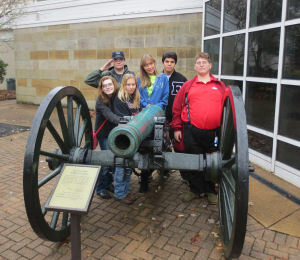 We had a very interesting time in the Visitor’s Center where we watched a new, 27 minute long movie on the battle…then moved next door to the museum which housed the Fuller Gun Collection. For those of you into rifles…this is a must see as there were hundreds of rifles dating back to the late 1600’s through WWII; all in excellent condition and arranged chronologically. We then boarded our bus and made an hour tour of the battlefield…stopping to listen at all eight stations about the various troop movements. Indiana it seems played a very large role as there were many nice monuments scattered about. We left Chickamauga and made our way up to Lookout Mountain and Point Park which was the scene of the Battle Above the Clouds and it doesn’t take too much brain power to understand why it got the name it did…as Lookout Mountain sits high above Chattanooga. The Riverfront area is very nice and has a walking bridge that allows you to cross the Tennessee River and visit the northern part of Chattanooga. On Sunday, me, the kids, along with Ms. Miller and Vickie…made our way once again to the river and walked across the bride, then back again. There are parks on both sides of the river that make for an awesome outdoor experience. Our final day was a grand one; I awoke early and had the kids loaded and once again up on Lookout Mountain by 8am where we parked the bus and walked back out to Point Park. The photo above is from that morning and shows the natural beauty of the area. The air this morning was crisp, cool and as clear as it gets…giving us all an excellent opportunity for photos. As I stood there that morning with my crew mingling around, talking and taking photos…I became proud to have once again been able to journey to such a vivid place…and to share it with a great group of kids. If you are in the area, please point your car in the direction of Chattanooga as I think you will have a spectacular time while Enjoying the Great Outdoors. One final note: on one of our nights to the downtown area we were treated with an incredible experience as we watched a true artisan who demonstrated how to blow glass as he helped a female client mold and make her own Christmas Ornament from scratch. I filmed the entire process and you can see it by clicking here. I think you will find it very interesting as the craftsman was a native Hoosier from Richmond, Indiana.